I admire Bill Moyers, but I found a problem with what nobody said during the first episode of his new show last week. The elephant in the drawing room. Wait – stop thinking! I have an answer for you if you are about to tell me that I don’t deserve Bill Moyers, that he is far more talented than I am, and who am I to tell Bill Moyers what is wrong with his show, and besides it’s only a matter of opinion. Me/him, yes it does remind me a bit of the delegation of American do-gooders who went to India to educate HH the Dalai Lama. But if that’s what you thought, please go back and read the first sentence again. 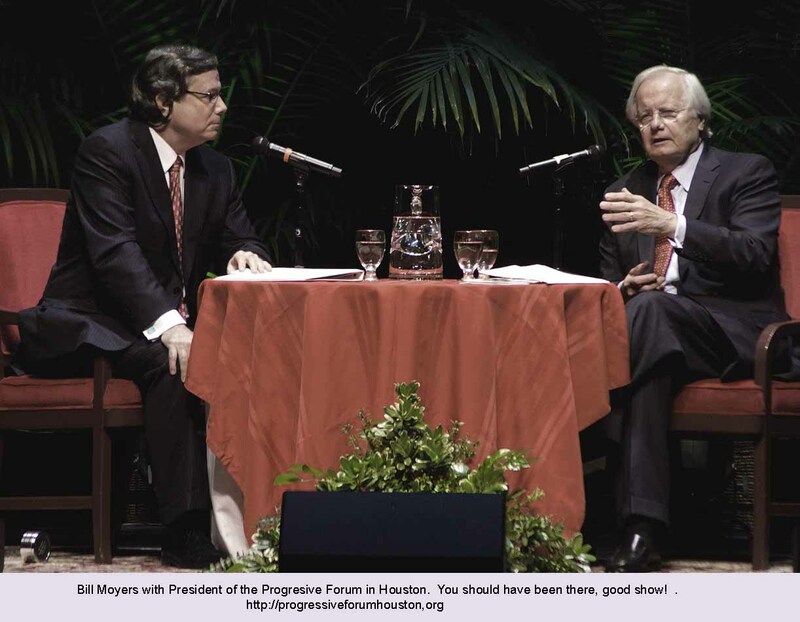 I admire Bill Moyers, I stopped pledging our local PBS station (against his advice) specifically because they dropped Bill Moyers, for political reasons, a couple of cycles ago. I believe that neither I nor America deserve the lifetime of responsible contribution that Bill Moyers has given us, I can’t hold a candle to his expertise except in one area of my own expertise, and I didn’t say he is wrong. So take that, and please listen to what I am saying. For the sake of us all, including Bill Moyers, and even the people of the top 1%. What is it that Bill Moyers and the two authors of “Winner Take All Politics,”Jacob Haecker and Paul Pearson, didn’t say that is critical to our recovery? What is the unspoken false assumption that lies behind almost every discussion of our economy and our politics on all of our media, even the internet? All of these discussions assume the omnipotence of human kind on this earth, and they assume the validity of the basically invalid assumption upon which modern economics is based, which is that resources are infinite. We can grow forever through technology. Whoa, there, you might now be saying. They can’t talk about everything at the same time. That is a real mouthful of assumptions that you want us to factor into this one little hour that is about politics. Not eternity. I have two answers to that. The first is the story of the blind men and the elephant, and the second – the authors themselves referred to the “ecosystem of politics,” so they opened that door. There is no such thing as an ecosystem of politics and I will therefore tell you what an ecosystem is – really what it is. And why we need to think accurately instead of metaphorically — and talk about the REAL ecosystem — if we want to accomplish any political or economic or social human goals. But first the six blind men and the elephant. You will remember, one blind man felt of the tail and said an elephant is like a rope, another felt of the leg and said an elephant is like a tree, and so on and on, the moral of the story was supposed to be that all of them were right and nobody knows everything. At least that’s the moral they told me. But remember the last part of that moral. It is true that nobody knows everything, but I say there must have been a 7th man who wasn’t blind, or there would have been nobody to tell the story. Whoever that 7th man was, his obligation to the community was to help all seven of the men to deal with the elephant in a sensible and constructive fashion. I do not believe the story means that it’s OK to let anyone stumble around in the dark believing things that will cause harm to everyone. I say there is an obligation of the person who can see — to work together with the blind men. I say also the blind men have an obligation to respect the knowledge of the person who can see. I say it’s wrong for anyone to take advantage of his perks by leaving everyone else in the dark. No human person and also no human organization is omniscient. Nobody knows everything. No human person and no human organization – not even the corposystem – is omnipotent. Nobody is all-powerful. Basically, that is because no human organization, not even American politics, is an ecosystem. An ecosystem is a living entity or system that uses and degrades energy to do the work of recycling the materials it needs to stay alive. Human politics, or human social relationships or all of human power added together is NOT an ecosystem, because we do not and cannot recycle the materials we need to stay alive. Food, air, water and soil, climate. The ENTIRE living ecosystem is the entity that recycles the things that the whole thing requires to stay alive. Human politics is a pinhead on the life of an ecosystem. Humans – human cultures – the whole span of the human species, are just a ripple in the tide of life. (This, by the way, is what the 1% don’t want us biologists to teach in school, thus the big fight against teaching evolution.) Furthermore, the primary function of the ecosystem is to automatically maintain the balances among those and all the other cycles of life. That’s the unifying vision of the whole. We ignore it at our peril. Humans, human politics, even the human corposystem, are not more powerful than life itself. If we really want to survive, that must be the foundational assumption of everything we do — and therefore of our political, social and economic human discussions. Food, water, energy and climate are made by the whole earth ecosystem, and only the whole earth ecosystem, and there is not an infinite supply because taking more than we give unbalances the balance of life itself. That’s basic REAL economics, and it’s a measurable fact. OK, so let’s factor in to our political discussion the basic economics of life, and the fact that we are only a part of life, not its central concern, what does that have to do with Bill Moyers and “Winner Take All Politics” and the corposystem? Well, maybe I don’t know enough about human systems, but I’ll tell you what I thought when I saw that graph they threw up (on Moyers web site) that showed the relationship between the incomes of the richest 1% of humans over the past 30 years – and the rest of us. I’ll give you a hint, I did not think: “Let’s overthrow the 1%.” I didn’t think of that because it won’t do any good to overthrow the 1% and still keep living as though we were omniscient and omnipotent on this earth. Without respecting the system, we would just make a different kind of mistake. Just as bad. So I did not think we should try one more political experiment without factoring in what we now understand about our place inside the whole earth ecosystem. What I did think was: “I looks like corposystem economics and politics have changed fundamentally, at the same time that the available physical resources (per person) of the earth have declined. The corposystem can not be making all that money off of increasing resources, so how are they making it? It looks to me very much like our corposystem have switched away from using non-human resources as the resources declined, and in recent time it has been more and more feeding off other other humans. Looks to me like the 1% is farming us, like my neighbor farms cattle – or a highly sophisticated form of slavery. I say Bill Moyers is one of the best we have, but his program will not be perfect until he approaches all of his topics of discussion with the awareness that ecosystem health, the availability of resources and the destruction of biodiversity are not separate issues from politics or any other human endeavor now that both are running short. Therefore, no matter what we decide to do about our politics it won’t solve our political/economic problems until we understand that we are neither omniscient nor omnipotent, and therefore our first (or at least concurrent) obligation is to figure out how to live in balance with the needs of the whole earth ecosystem. Anything less will be wasting what little energy we have left.